Galeras (Colombia): 21-23 Mar 09, white-coloured gas plumes to 5.4 km a.s.l., drifted in multiple directions; 17-24 Mar 09, SO2 levels high. Hunga Tonga-Hunga Ha’apai (Tonga): 18-19 Mar 09, ash plumes to 4.0-5.2 km a.s.l., drifted NE and ENE; 20 Mar 09, steam plumes to 1.8 km a.s.l. ; 21 Mar 09, eruption plume to 0.8 km a.s.l. Koryaksky (Kamchatka, Russia): 13 Mar 09, seismicity elevated; 14-20 Mar 09, seismicity at background levels; gas plumes with low ash content to 4 km a.s.l., drifted E; ash emitted from upper fumarolic vent. Redoubt (Alaska, USA): 20 Mar 09, shallow earthquake activity; 21 Mar 09, steam plume to 3.4 km a.s.l., increased seismicity; 22-23 Mar 09, six explosive eruptions, ash plumes mostly to between 7.6-9.1 km a.s.l. and to maximum of 18.2 km a.s.l.,with bulk of ash volume between 7.6-9.1 km a.s.l., ashfall reported 190-250 km NE, pyroclastic flows observed, extensive lahars; 24 Mar 09, steam plume to 6.1km, drifted65 km NW. Batu Tara (Komba Island, Indonesia): 20 Mar 09, ash plume to 2.4 km a.s.l., drifted NW. Chaitén (Chile): 10-16 Mar 09, continued growth of lava-dome complex, generating collapses and block-and-ash flows, ash-and-gas plumes drifted mainly SE; 20-21 & 23 Mar 09, ash plumes to 2.1-2.4 km a.s.l., drifted E and NE. Dempo (Sumatra, Indonesia): 23 Mar 09, alert level lowered following decreased seismicity. Etna (Italy): 16-22 Mar 09, degassing from NE Crater, NW Bocca Nuova vent, E flank of SE Crater, and summit fumarolic fields; active lava flows from NW-SE-trending fissure E of summit craters. Gamkonora (Halmahera, Indonesia): 23 Mar 09, alert level lowered following decreased seismicity; diffuse white plumes to 50-150 m above summit crater. Karymsky (Kamchatka, Russia): 12 & 18 Mar 09, seismicity above background; 12 Mar 09, ash plume to 3.9 km a.s.l., drifted E; 12-14 & 16-17 Mar 09, thermal anomaly on the lava dome, ash plumes drifted 200 km easterly. Kilauea (Hawaii, USA): 18-24 Mar 09, lava flowed SE through lava tube system to Waikupanaha and Kupapa’u ocean entries, scattered surface flows observed; 19 Mar 09, explosions from Waikupanaha ocean entry; Halema’uma’u crater continued to produce predominantly white plume; incandescence intermittently observed. Kuchinoerabu-jima (Japan): 18 Mar 09, alert level lowered following decrease in seismicity, deformation and SO2 emission. Lewotobi (Flores Island, Indonesia): 23 Mar 09, alert level lowered following decrease in seismicity; diffuse white plumes rose 25m above crater, drifted E.
Okmok (Alaska, USA): 20 Mar 09, alert level lowered following low seismicity and no activity. Popocatépetl (Mexico): 18-24 Mar 09, steam and ash emissions; 23 Mar 09, explosion ejecting incandescent fragments, plume to 6.7 km a.s.l., drifted E.
Rabaul (Papua New Guinea): 16-20 Mar 09, grey ash plumes from Tavurvur cone to 1.7 km a.s.l., drifted E; incandescence from summit crater observed at night, incandescent tephra occasionally ejected from crater during heightened activity; light ashfall reported downwind. Sakura-jima (Japan): 20 & 23 Mar 09, explosions reported. Shiveluch (Kamchatka, Russia): 13-20 Mar 09, seismic activity above background levels, ash plumes likely rose to 3.5 km a.s.l. ; 12-14 & 16-19 Mar 09, thermal anomaly on lava dome; 13, 14 & 18 Mar 09, strong fumarolic activity; 14 & 18 Mar 09, incandescence from lava dome seen at night. Soufrière Hills (Montserrat): 18 Mar 09, pyroclastic flow travelled E down the Tar River Valley and almost reached the sea. Tungurahua (Ecuador): 17-18 & 22 Mar 09, ash plumes to 5.5-7.5 km a.s.l., drifted W, NW, NNE; 17 & 20 Mar 09, ashfall reported downwind; 21 Mar 09, lahars descended Mapayacu drainage to SW and Mandur drainage to NW. Ubinas (Peru): 18 Mar 09, plume to 7.9 km a.s.l. 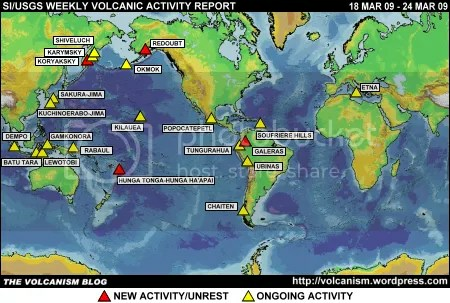 The foregoing is a summary of the Smithsonian Institution/United States Geological Survey Weekly Volcanic Activity Report covering 18 March 2009 to 24 March 2009. It is provided for information only, and is based on but not a substitute for the full report, which comes with its own criteria and disclaimers. The map base is derived from the Smithsonian Institution/USGS/US Naval Research Laboratory This Dynamic Planet website.